When the P.R.C. was founded in 1949 China built up a new structure of government. As a Communist state the structures bear a Marxist-Leninist imprint rather than evolving from Chinese Imperial structures. However following long tradition, it remains a system of well educated officials appointed by merit rather than patronage. Governing a nation of a billion people is beyond the capability of a small political élite. Many national initiatives have failed because they have not been implemented correctly at the local level. For instance, on environmental protection the observance of legislation at a provincial level has been very patchy. With ten provinces each with populations of over 50 million the sheer weight of numbers make central governance a struggle. Comparison with the federal structure of the United States reveals how power has to be devolved to administer such a huge nation state. Cities have a lot of devolved power. For example access to services such as health care, education, policing is only for residents holding a permit. It is strange to live in a city and yet not be allowed to ask police for assistance just because of the lack of a residence permit. There are in fact very few rights at the national level. The economic reforms since 1988 have placed increasing stress on the system of government. Huge economic power is wielded by large companies outside the control of the ruling Communist party. China remains a one party state. To be a government employee you need to be a member of the Communist party. In 2017 there were 89.45 million members of the party (75% men; 25% women), the largest political party by far in the world. Party membership is a passport to employment in the civil and military services, so many join as a career choice rather than a belief in political philosophy. Democracy is limited to choosing between different party members standing for election. Sometimes candidates will have opposing views on future policy and so some genuine choice does exist. Officially there are eight other 'democratic parties' that run under the aegis of the communist party, in fact these are more like special interest groups rather than broadly based parties. These democratic parties include: ‘Taiwan self-government ➚’; ‘Returning Overseas Chinese’ and the ‘September 3rd Study Group ➚’. All together these parties have a combined membership of just 600,000. The Communist party is involved at all levels of the civil and military services as well as the judiciary. There is no clear separation of party and state; government and judiciary as there is in other countries so it is very hard for an individual to take the government to court. Absolute power rests with the Standing Committee of the Politburo (SCP) of the Communist Party. It has seven members ( reduced from nine in 2013). The full Politburo has twenty five members that select the Standing Committee. The Politburo itself is elected by the Central Committee of 204 members. The National Party Congress in turn elects the Central Committee once every five years (the 15th Congress had 2048 members). The Standing Committee holds all the powerful government positions: President; General Secretary; Premier; Military Commission Chairman; Chief of Security etc.. The responsibilities and power of these posts have changed over time. For example Deng Xiaoping did not hold high office but was still the 'paramount leader' of China with ultimate authority. Powerful players have managed to expand their roles at the expense of other Politburo members. The Politburo is very male dominated, with only one or two women ever on it. In 2019 there was only one woman. No woman has ever been elected to the SCP. 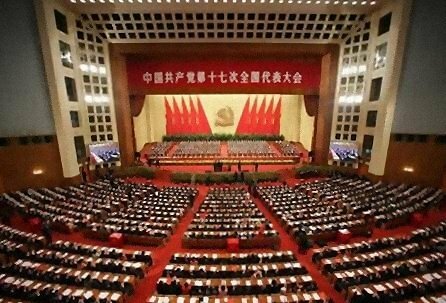 The State Council is responsible for turning policy into practice, it is the administrative function in China. It carries out the day to day running of departments and ministries. The Council is headed by the Premier aided by Vice-Premiers and reports its progress to the National People's Congress. The term of office on the Council is five years. The NPC is a grass roots organization that appoints the Premier and State Council. It can amend the constitution and meets every year for fifteen days at the Great Hall of the People in Tiananmen Square. The National People's Congress is democratically elected by all the people of China. Local elections vote for members at the provincial level, these in turn elect those on the NPC. The body rarely challenges the guidance given to it by the Central Committee but it is put forward as the main democratic function within government. It is a forum where the finer details of policy are thrashed out, and the concerns of individual provinces and pressure groups are taken into account. The Standing Committee of the NPC carries out the work between meetings. The Chairman of the Standing Committee of the NPC is the chief officer and is also a member of the SCP. The NPC has a number of influential standing committees. The NPC should not be confused with the National Party Congress that meets every five years to determine Chinese Communist Party policy. The President of China is the official head of state and became briefly a more symbolic role in the years 1982-2010. Before 1982 the Chairman/President was at the pinnacle of the power pyramid. In the early years the head of state was called 'Chairman' but acted in the same way as a President in other countries. The more ceremonial role of President was instituted in 1982 in an attempt to diffuse power among several senior members of the party. This post covers such duties as overseas visits and meeting foreign dignitaries. The President is supported by one or more Vice-Presidents. Confusingly the post of ‘Chairman of the People's Republic of China’ used to exist as well as ‘Chairman of the Chinese Communist Party’. Mao Zedong held both posts for a while and then on Liu Shaoqi’s fall from power Mao did not install anyone to replace him. Vice Chairmen Song Qingling and Dong Biwu became ‘acting’ chairmen in 1968 but Mao was the effective leader from 1968 until his death in 1976. The Premier of China co-ordinates the work of the State Council. The premier implements policy rather than forming it. He is supported by one or more Vice-Premiers. The unofficial title of Paramount Leader has been used by people powerful enough to be pre-eminent within the Politburo. The Paramount Leader has, at times, not had day-to-day administrative duties but can quickly intervene and take decisions in any area of government. This is the person who directs policy and makes the key decisions. Since Deng Xiaoping the President has been the Paramount Leader. During the Long March Mao Zedong became chairman of the party. This was the chief party post up to 1978 when Deng had become paramount leader. In 1982 the post was abolished and the General Secretary became the chief party role. Chief Officer of the ruling Communist Party is the General Secretary. Between 1921 and 1934 this was the main position in the party. The post was abolished in 1945 before being re-established in 1956 as a senior but not pre-eminent role. In 1982 it again became the top post within the party and therefore taken by the Paramount Leader. The central committee consists of the inner ‘Politburo’ of the Standing Committee as well as the Provincial governors and senior party officials. Younger, more junior, members sit on the committee as a proving ground (for instance as mayors of large cities). It has just over 350 members who are selected by the Communist Party Congress. The Chinese system has inherited some of the less useful attributes of the Imperial Civil Service. A job as a government official has been considered a good, secure job for a thousand years or more. The Civil Service has many grades and is stuffed full of bureaucratic functions. Following a tortuous official route is the only way of getting decisions made and implemented. There are continuing efforts to root out graft as corruption has for centuries been ‘accepted’ as part of the job - there is limited scrutiny and accountability and the basic salary is low. Ordinary Chinese take the view that such wasteful bureaucracy is inevitable, even the Chinese version of heaven and hell is stuffed full of a complex hierarchy of bureaucrats. In the dying days of the Qing dynasty an official was given a nominal salary, this was considered as an incentive for him to work hard to exact bribes and commissions rather than doing very little. A Chinese People's Armed Police guard on Tiananmen Square, in front of the portrait of Mao Zedong. His rank is the second lowest, Private First Class . 4th June 2007. Photo by Luo Shaoyang ➚ from Beijing available under a Creative Commons license ➚. After a Civil War it is often the case that the Army stays in power for a long while. In China the People’s Liberation Army (PLA) was for a long time inseparable from both the government and the party. The role of the Army (and other services) was re-invigorated by the Cultural Revolution. It was Army backing that brought back both Mao and Deng from the sidelines. In the Tiananmen Incident it was the power play between military and party leaders that determined the violent outcome. In the last 30 years a slow reduction of military involvement in politics has taken place. The active armed services numbered over 2.2 million in 2017, the largest in the world but on a per capita basis it is very modest (for example Luxemburg has a surprisingly higher proportion in active service). The effective Commander-in-Chief of the armed services is the Chairman of the Central Military Commission (CMC) who is always a member of the SCP and usually the Paramount Leader; this underlines the strong links of the Party to the Army. Confusingly there is also a party post ‘Chairman of the Central Military Commission of the Communist Party’ and these posts are often taken by the same person. The military is structured into three general departments: logistics; political and staff. The service divisions are: air force; second artillery; navy and people's armed police. The post was vacant from October 1968 to January 1975 and then abolished until being re-established in 1983. In many countries the legal system is kept separate from government. For example in Pakistan, it is the legal system that controls what the government can do. In China the Communist Party appoints the top posts in the Judiciary and so is only vaguely outside its control. However, laws are officially enacted through the National People's Congress rather than the party. Chairman Mao's dictum that the country should be ‘ruled by people rather than by laws’ is gradually being replaced by a written constitution. However, the constitution remains very much a party creation. People who are concerned about human rights in China believe this system is heavily biased towards the state and against individuals. It is rare for an individual to prosecute the administration and win. China retains the death penalty and puts more people to death than all other countries in the world put together. The death penalty has been applied to crimes such as computer hacking; tax evasion and bigamy. One person within the SCP may typically hold several posts. So Xi Jinping in 2013 is President; General Secretary of the Communist Party and Chairman of Central Military Commission making him by far the most powerful person in China and ‘the Paramount Leader’. 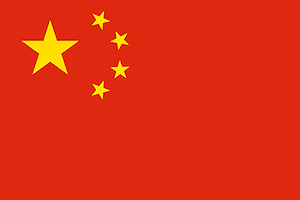 Citation information for this page : Chinasage, 'The Government of China', last updated 28 Nov 2016, Web, http://www.chinasage.info/government.htm.